For those who wish to alter the appearance of their staircase without the hassle and expense of replacing your entire balustrade, a replacement of a newel post can make a substantial change to your overall design. 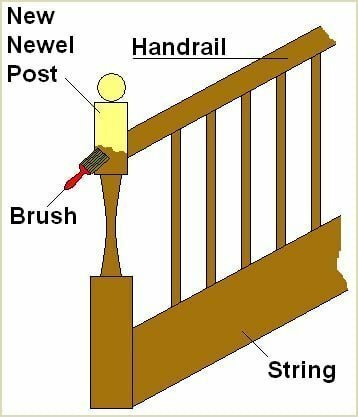 The replacement of a newel post can be a tricky job, but taking your time to perform each step will pay dividends. Here at Pear Stairs we have a wide range of replacement newel posts at competitive prices and to suit every taste. 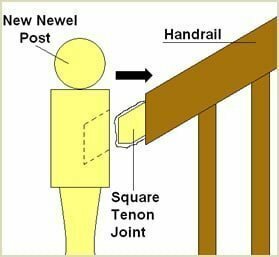 Method 1 - Using Your Existing Handrail Tenon Joint To Secure Your Replacement Newel Post. 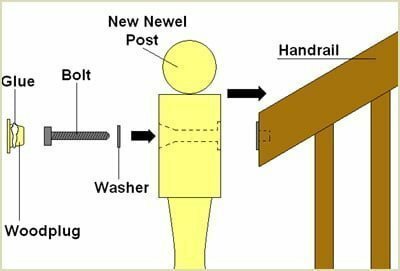 Firstly, with your new replacement newel post, hold it against your old newel post and mark on the replacement where roughly the handrail will enter the post. Also, mark at the base of the existing newel, where the replacement newel post will sit on top of this "stump". Our newel posts have a pre-installed 50mm dowel already in position in the base of the post so that they can easily and securely fit into position for replacement of a pre existing newel post. 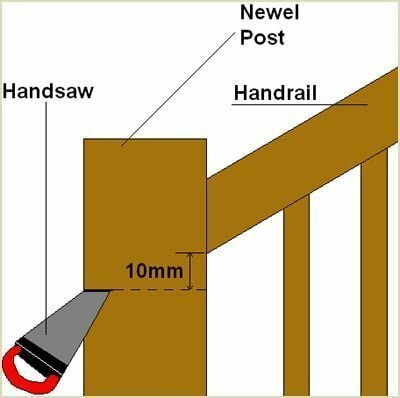 Approximately 10mm above where the handrail enters the newel post, draw a line squarely around the newel post and using a handsaw start to cut the post at this line. 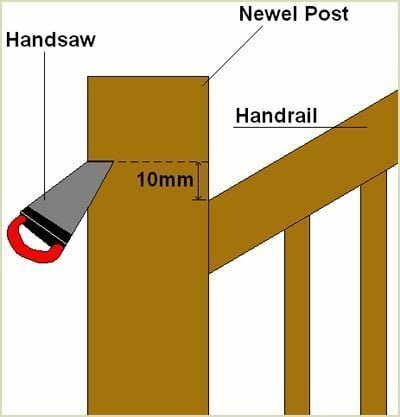 With the top of the newel post cut off, measure 10mm below where the handrail enters the newel post and squarely draw a line around this point. Cut into this section of the newel post. 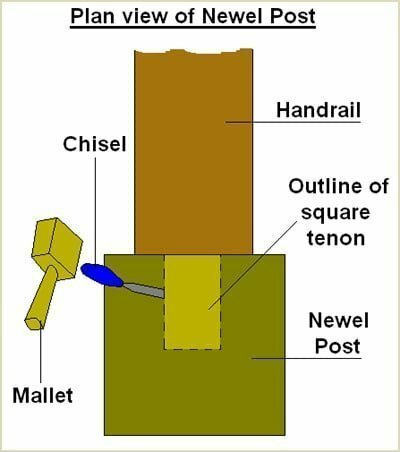 Carefully using a sharp wood chisel and mallet on the top of the exposed newel post, chip away the excess wood around the square tenon joint that is built into the handrail. Slowly chisel away at the surrounding wood until the square tenon joint is clearly and fully exposed. Where you marked the old newel post in "Step 1", cut this line with a handsaw to form a "stump". Sand down the stump carefully so that it is very smooth. 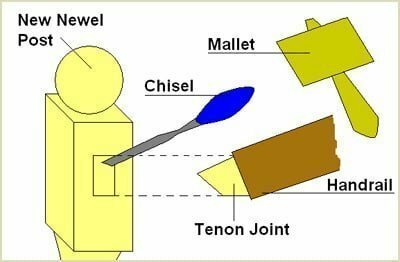 To mark the centre point of the stump, draw two diagonal lines from each corner and where they meet is the centre point, Using a 50mm arbor bit and cutter, slowly drill into the top of the centre point of the stump. Drill down as far as possible with the cutter, pull out and using a sharp chisel, chip away the remaining plug. 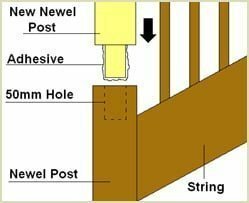 Repeat this process until the hole is a depth of 10mm more than the length of the dowel on the replacement newel post. On the replacement newel post, mark out on the top edge of the post the position that the square tenon joint will fit into the newel. Using a sharp chisel, chisel out the mortise for the tenon joint on the newel. 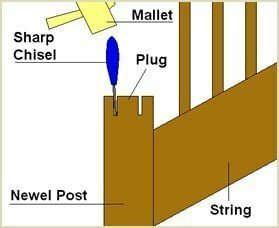 Apply adhesive, either PVA wood glue or epoxy resin, to the dowel at the end of the newel post and dowel hole in the stump and gently lower the post into the position on the dowel. 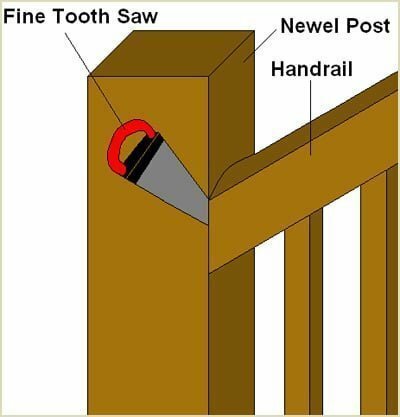 Also apply adhesive to the square tenon joint in the handrail and fit this into the newel post. Allow 24 hours for the adhesive to dry. Once this is complete,sand and stain or paint your new newel post to match the rest of your staircase. 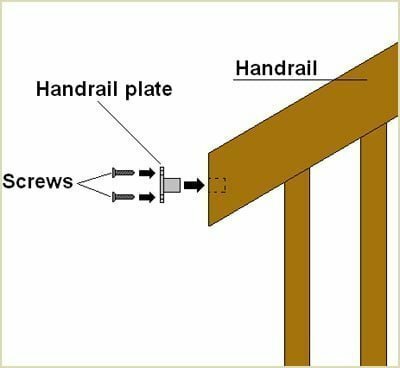 Method 2 - Using Our Universal Handrail Fixing Kit To Secure Your Replacement Newel Post. 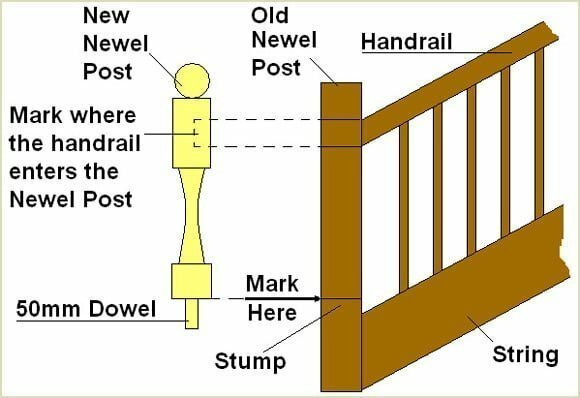 Firstly, with your new replacement newel post, hold it against your old newel post and mark on the replacement where roughly the handrail will enter the post. Also, mark at the base of the existing newel, where the replacement newel post will sit on top of this "stump". 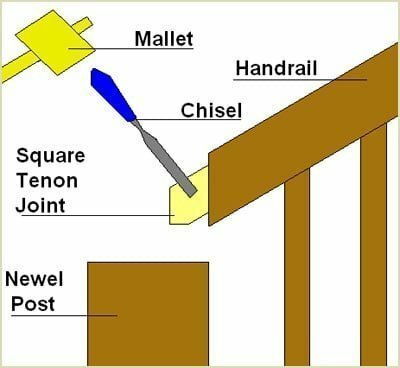 With a fine toothed saw, seperate the handrail from the newel post by cutting down through the tenon joint as shown. Where you marked the old newel post in "Step 1" cut this line with a handsaw to form a "stump". Sand down the stump carefully so that it is very smooth. To mark the centre point of the stump, draw two diagonal lines from each corner and where they meet is the centre point. Using a 50mm arbor bit and cutter, slowly drill into the top of the centre point of the stump. 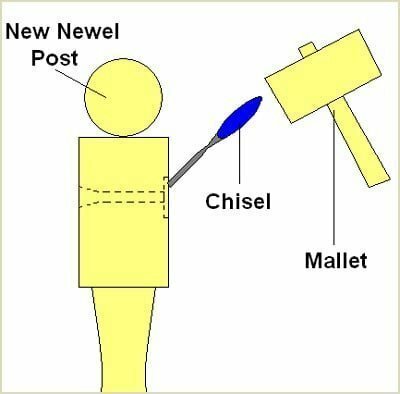 Once the dowel hole is drilled, without the use of the adhesive, slot the new newel post into place on top of the stump. 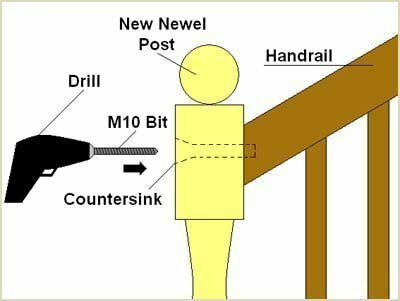 With the replacement newel post temporarily in its place, drill and countersink an M10 hole straight through the top of the newel post and into the handrail as shown. 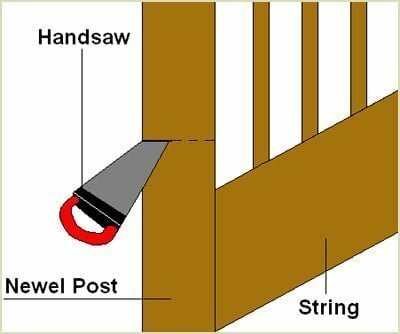 Remove the newel post from the slot in the stump. Align the handrail plate with the pilot hole you have just drilled through the newel post. 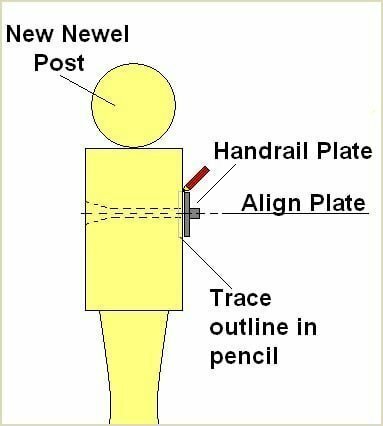 Trace with a pencil around the plate onto the newel post as shown. Chisel out the depth of the newel plate out of the traced square on the newel post. Next, screw the handrail plate into place on the edge of the handrail, as shown. Now, apply adhesive onto the dowel at the base of the newel post and fit into place on the stump. 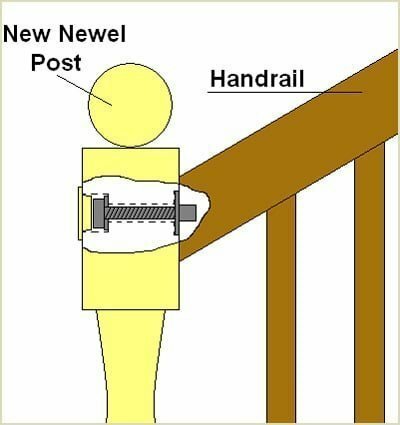 With the newel post in its final resting position, thread the long bolt through the newel post and affix to the handrail. Apply adhesive to the wood plug and fit over the hole in the newel post as shown. 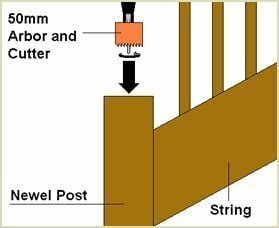 Make certain you align the wood grain of the plug with the direction of the grain of the newel post. Allow 24 hours for the adhesive to dry. 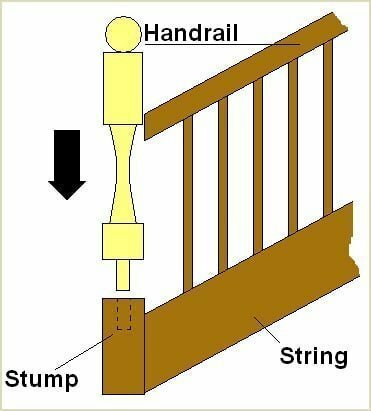 Once this is complete, sand and stain or paint your newel post to match the rest of your staircase. Pear Stairs sell a number of products to finish your staircase. Remember if you have any questions don't hesitate to phone us, about your staircase finish.